Orthodontics is the branch of dentistry concerned with the treatment and prevention of irregularities of the teeth and jaws. Orthodontic treatment can straighten teeth and move them into a better position. Crooked teeth in children are quite common and so if necessary when appropriate we will refer to an orthodontist. 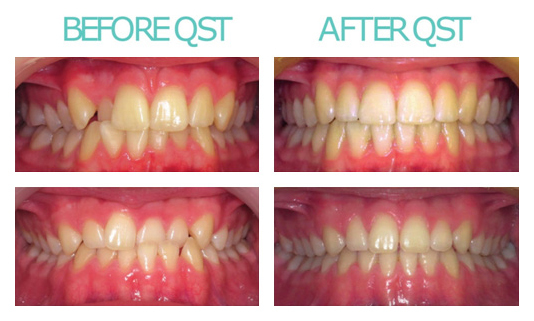 Quick Straight Teeth™ are an affordable, comfortable and effective way of straightening your teeth to give you a perfect smile. The invisible braces can correct mild to moderate problems quickly, making it more affordable than similar options. They work by only concentrating on the front 6 to 8 teeth and can offer great results in as little as 4-24 weeks. In cases where significant movement is required they may not be appropriate and we may recommend you see an orthodontist. Quick Straight Teeth™ use either removable appliances or clear fixed braces. All are made of transparent materials to provide an almost invisible appearance giving you the ability to get straight teeth quickly but without the bulky metal coloured braces that most adults don’t want. Most people will be unable to tell you are wearing Quick Straight Teeth™, making teeth straightening, discreet and comfortable. If you would like to find out whether Quick Straight Teeth™ can give you the smile you’ve been looking for then contact us on 01789 292460 and we can arrange your smile consultation appointment.